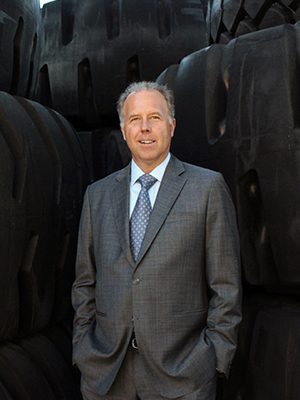 Jeff Barna is President of Yokohama Tire Corporation. Previously, he served as the Chief Operating Officer. Mr. Barna brings 30 years of sales, management, and operations experience, covering both North American and South American markets. He served as President at Nilfisk Inc. America’s Region, a global company in the professional cleaning product manufacturing and service industry. Previously he held key management positions within global battery manufacturer Exide Technologies where Mr. Barna managed their entire America’s customer portfolio and service divisions including all aftermarket and OEM customers. Prior to his roles at Nilfisk and Exide, Mr. Barna also co-founded a logistics and supply chain solutions company catering to the temperature-controlled food industry. Mr. Barna started his career as a salesperson working with small retailers and redistributors while working his way up to the top in the automotive aftermarket business. He started selling Monroe shock absorbers to small businesses in the metropolitan New York market, before progressing to large auto parts chains, auto manufacturers, mass merchandisers and OEM’s. While leading each of these respective businesses, Mr. Barna has been adept at implementing high impact go-to-market strategies, organizational restructuring projects, enterprise growth and profit optimization. All the while, he maintains a conviction that culture is the most important foundational element of any business. Mr. Barna has a Bachelor of Arts degree in Political Science with a pre-law concentration from the College of William and Mary. He and his wife, Lora, reside in Southern California. They have three children and are very actively involved in their lives.